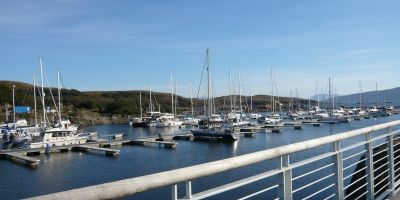 Portavadie Marina holds 230 water berths that can accommodate vessels up to 70ft. The berths are accessible regardless of tide due to the marina being purposeful built in a man made location. Berth holders have access to all facilities including engine repairs+ electrical installations. The marina was awarded a 5-star Golden Anchor Award for its excellent services. Portavadie is a tiny, man made town in Argyll and Bute. Portavadie Village (or rather a collection on stone cottages) was around for a long time before “The Hole” was excavated, and lies between Portavadie Marina and Polphail. The area that is now Portavadie Marina was a actually a tidal bay, known as The Salen. Originally designed for the construction of offshore oil platforms, the site failed in 1975 - the market for concrete oil rigs had gone by the time it was complete and the North Sea was turning to steel platforms. The area was eventually sold and converted into a fish farm in 1988. The marina was built in 2006 and the harbour was modified in 2007. 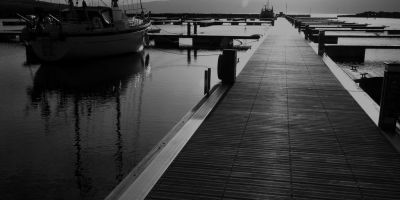 The marina is known as one of the finest in all of Scotland. To the south of the marina lies the village of Polphail, originally built for the workers of the construction yard, it now lies abandoned and empty. The village boasts one of the most expensive and largest man-made holes in the world, totalling between £7 and £17 million to make. 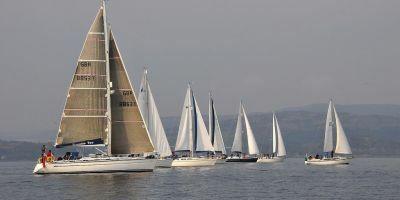 In the last couple of years the marina has hosted The Fife Regatta, The Viking Raid, The Commonwealth Flotilla and provided berthing/accommodation for The Scottish Series, along with a host of Yacht Club/Manufacturer Specific Musters. The resort also hosts many land based events. The Kyles of Bute is a secret golf course set on the hills above Kames. The 9-hole course offers amazing views of the island around it as you play. Portavadie also offers easy access to tons of local attractions and gardens across the water. 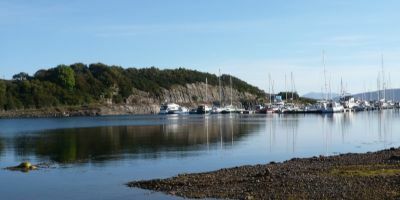 You can check the latest local events at www.argyllsecretcoast.co.uk - there’s the Kyles 10k run, Kyles Regatta (also a rowing regatta), Kyles Music Festival etc. As far as food and drink goes, there’s only one place you could want to go in Portavadie. The Marina Restaurant is renowned for it’s excellent food, service and quality. The menu has a wide range of options and all the staff are friendly and knowledgeable. The restaurant offers great views over the bay as well as extremely reasonable prices for the quality. If you're after something a bit more relaxed then there is also the Lodge, which offers more of a pub style menu. Long / Latitude: N 55° 51' 59" W -5° 18' 46"
Train travel will take you from Glasgow to the nearby ferry terminal at Greeock. From there, a ferry across the water and a coach to Portavadie will set you back four hours in total. Coaches are available from Glasgow and are generally cheaper than the train, although even slower. In total, it’s around 5 hours for the 80 mile drive. It’s an 80 mile drive around the headland to Portavadie from Glasgow via the A82 and the B8000, taking a total of two hours. Alternatively the drive to Greenock via the B836 and the ferry will cost extra, but will cut your travel distance by around 30 miles.